We mentioned the nominees for this year’s Grammy Awards. Now we have a list for one of the most anticipated parts of the show; the performers! Everyone loves a great performance, from some of their favorite artists, especially at one of the most viewed awards show! R&B artist SZA, singer Sting, Sam Smith, Lady Gaga, Pink, Kesha; rappers Kendrick Lamar and Childish Gambino, and Rock band U2. The Recording Academy also shared that there will be a number of paired acts. They include: Miley Cyrus & Elton John, Alessia Cara, Logic, and Khalid performing their suicide prevention hit, “1-800-273-8255”, which is nominated for “Song of the year.” It may get real, wild, wild, wild with a possible performance from BadgalRiri, Dj Khaled, & Bryson Tiller and dynamic duo, Cardi B, and Bruno Mars! "It's the Grammys — hope a (girl) take one. Let me take it to the Bronx," she said at her performance last night, according to Foxnews.com. Yesterday, Janet Jackson also presented Missy Elliott with the “Visionary” award at Essence, ninth Annual, Black Women In Music, Pre-Grammys Ceremony, at the Highline Ballroom in NYC. Fox News.com, says the Essence event is just one of dozens being held around NYC ahead of the awards show. 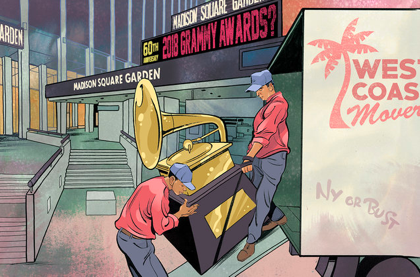 This is the first time since 2003, the Grammys will be back in the Big Apple after being held in Los Angeles. We can't wait to tune in Sunday to see all the winners & performers!